We have returned to North America via Miami and are currently sweating profusely with a couple of cold beers in hand. We arrived here on Wednesday July 2nd in the afternoon after a rather eventful flight on Copa Airlines from Buenos Aires. In an effort to save money, our flight had three plane changes and two stopovers (one in Panama City, and one in Nassau, Bahamas). It was a pretty good deal at just over $1000 per ticket and saved us quite a bit of money even if it involved more than 16 hours of travel time and 5 hours of layovers. Our first leg was a red-eye departing close to 1 a.m. on Wednesday morning, so we arrived at the airport on Tuesday night and boarded the plane. Air freight is based on “volumetric weight”, the end result being, if you can lower the bike by removing the front wheel, it wheel be cheaper to ship. As somewhat of a nervous flier, I had taken copious amounts of Dramamine in order to sleep through as much of the flight as possible, so it was through groggy eyes that I realized that we were sitting on the tarmac for longer than expected. 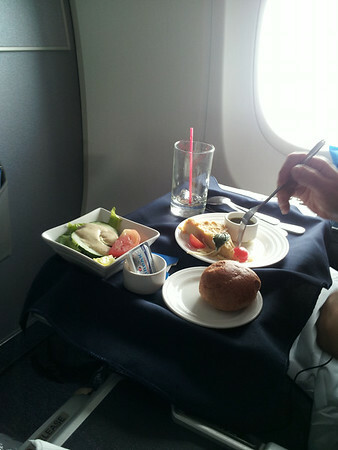 The flight attendants started to come around and distribute drinks and snacks. Not really a good sign. In the end, our flight had been delayed for two hours due to heavy fog. Something that I didn’t really understand since Buenos Aires airport was located in a known fog area, and somehow flights are still booked under the pretense of being able to take off on time. When we eventually took off, it was 2:30 a.m. It wasn’t really a big deal except that our connecting flight from Panama City to Nassau was at 7:30 a.m. after an hour and a half layover. It was fair to say that we missed the second flight before even taking off from the first one. I slept most of the way, but also managed to take advantage of the in-seat monitors that showed movies, television shows, or allowed one to play some simple games (Sodoku, Bejeweled, Bowling, etc.). Breakfast the next morning was a barely edible mess of soggy potato cubes underneath a blanket of scrambled ‘eggs’ in some sort of red sauce. We also got a yogurt, a roll, a browning fruit cup, and a drink. This Jimmy Buffet guy gets around! Of note, a can of Panamá beer from the supermarket costs $0.59. You would think that you might be able to pick up an ice cold can of beer to quench that tropical thirst at a huge markup of, say, $2.50 per can. Nope. That 59 cent can has $4 to $5 tacked on to it and you have to take it to cafeteria seating. If I am not mistaken, this makes Toronto’s Pearson International Airport somewhat affordable, all things considered. It was not, by any standards, a culinary experience that one would want to savour, so I wolfed it down as fast as possible in order to squash the feelings of hunger. Our landing was uneventful but roused a round of applause from the passengers. We were met at the gate by a Copa agent who helped us arrange a new flight, since ours had left an hour and a half prior. Luckily we were booked onto a plane that would be flying directly to Miami rather than making a stopover in Nassau. On the plane, Adam had been questioned (pretty much chastised) by the steward as to why we took that strange roundabout route, to which he replied that it was much cheaper (about $600 cheaper) to take the diversion to Nassau rather than fly directly. The agent also arranged for our bags to be transferred to the new flight rather than us having to pick them up and take them to the new gate. Even though the flight was pretty full, we were able to get two seats together in the emergency exit row, which typically has more leg room. As usual, it was mass chaos when it came time to board. 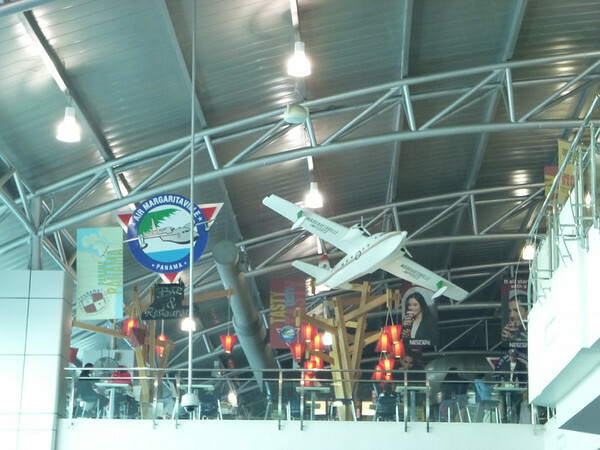 The Panama City airport, while touting itself as being The Hub of the Americas, leaves some things to be desired in terms of its organization and security procedures. Even though we had just gotten off an airplane we were forced to go through an additional screening process where our carry-on bags were searched and passengers had to go through the metal detector. We were also not allowed to take water into the waiting area (I’m pretty sure this has something to do with airlines being in bed with bottled water companies). I remembered this from my previous trips going to Miami and still can’t figure it out. After the cattle wrangling methods employed to get passengers on the place, and having our passports checked by one single employee, we arrived at our seats where we found other people sitting in them. After much deliberation and a bit of arguing, the seat thieves, whose argument was that they wanted to sit there and decided that it would be OK even though their tickets said otherwise, were moved to seats across the aisle and we were able to sit down. A short time later our names were called over the intercom, requesting that we return to the front of the plane. What now?? Apparently our seats had been resold to a rather large man who needed two seats and extra space, and we were being bumped to different seats. I could only imagine the worst until we were shown to two seats in business class. We are unsure whether the staff took pity on us after first being delayed so long on the first leg and then had to deal with seat stealers, but the upgrade was very much appreciated, and I have vowed to never fly economy ever again. 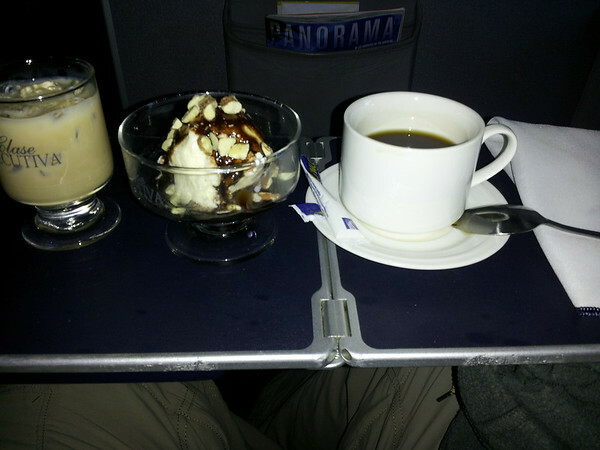 Pillow and blankets awaited us on our seats, and steward came around almost immediately to take our drink orders. As our drinks were being prepared, headsets were passed out for the movie which turned out to be the Lego Movie, which wasn’t my first choice but turned out to be somewhat enjoyable (everything is awesome!). We were then asked if we wanted chicken or salmon for lunch, and brought a hot towel. A far cry from the scrambled eggs served over soggy seemingly day old fries of the earlier leg. Our drinks were delivered in classy glass glasses (versus economy plastic) with a small bowl of mixed, warmed snacks (pretzels, sesame sticks, and almonds). Our first course arrived on a platter lined with a navy blue cloth napkin with a salad, a warm roll with butter, and a slice of fainá with warm olive oil for dipping. With drinks refills on their way, our main course was served. The chicken was a chicken curry served with rice and a small dish of ‘butter chicken tomato gravy’; Adam’s salmon was in a cream sauce and served with pasta. Dessert arrived shortly: vanilla ice cream with choice of topping and a liqueur, if desired. Since I desired, I had a glass of Bailey’s, and it wasn’t a little Dixie cup of Bailey’s, it was a tall liqueur glass, served on the rocks. With as many refills as we wanted. 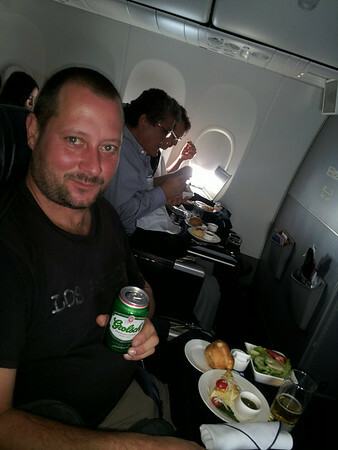 I’m telling you, business class is the way to go. Stuffed and happy, we rode out the last 30 minutes of the flight in a food coma. Sir? Can I offer you another beer? After disembarking the airplane, we were put into a queue for immigration to check our passports. Although a short line, this also took ages as the immigration officers took their time scanning peoples’ fingerprints and took their photographs. When it was our turn, our passports were stamped for the very first time ever entering the United States. We were given six months in the USA at which time we would need to have our passports stamped at the USA-Canada border when we entered back into our own country. The officer then wished us well and told us to be careful driving in Miami as there were always plenty of accidents involving motorcycles. I wondered if she had ever been to Lima. Nice! Definitely makes of for being missed on the refreshment service (i.e. simple cup of water) on the first leg. 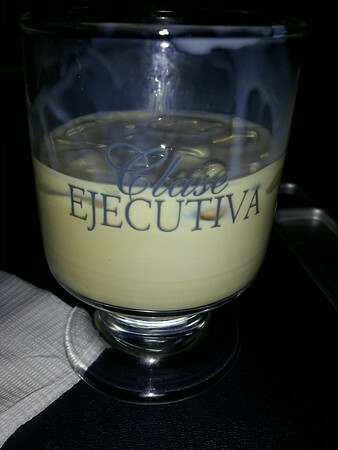 “Clase EJECUTIVA”. After all, we are the “executive officers” of Trans-Contintental Mambo. 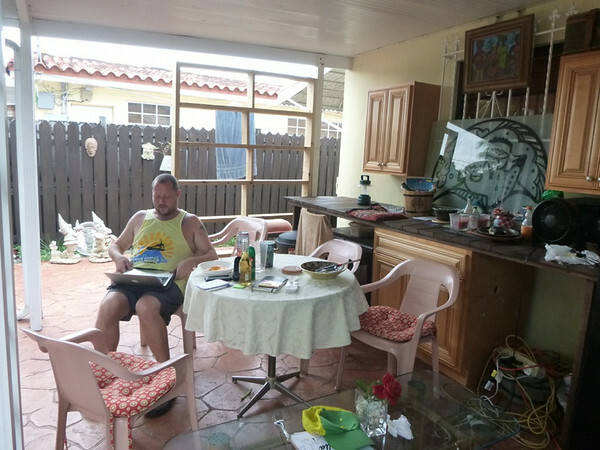 We picked up our luggage (be warned that the cost of a luggage cart in Miami is now $5), and went to arrange a meeting point with Aldo, our host at Sun Tan Villa, where we would be staying for a few days. 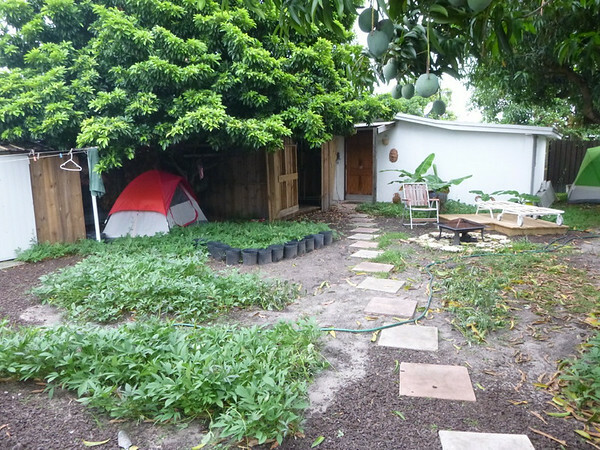 After some initial confusion, we eventually met up and were whisked off to Hialeah, a barrio of Miami, where we had booked a tent for a couple of days. 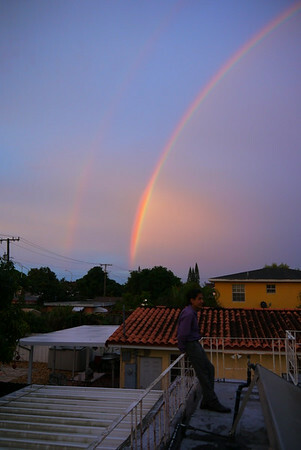 Primarily Cuban in nature, Hialeah was a pleasant transition back to North America. For us, the familiar sights of empanadas for sale, comida cafeterias, and signs in Spanish was a smoother way to ease back into our familiar territory. What hit us upon exiting the airport was the heat. Miami was very warm, hot I might even say, and very humid. I was not prepared for the drastic transition, and frankly had forgotten what ‘hot’ actually felt like. 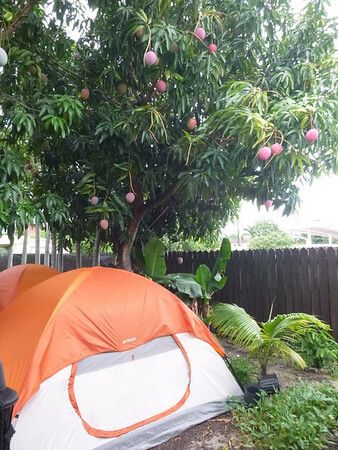 Life under the mango trees of Hialeah, a barrio in Miami. 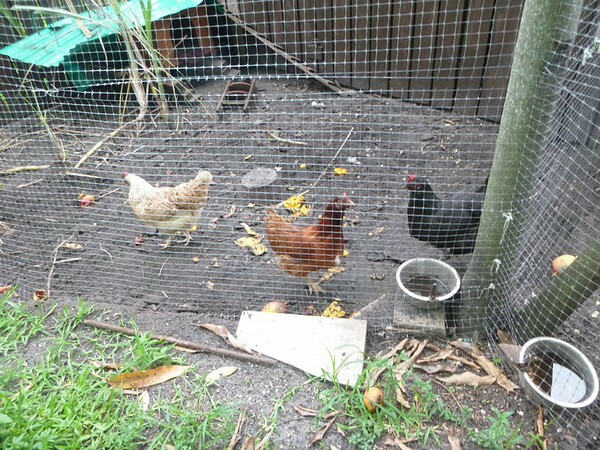 And the “normalcy” of hens and the occasional bay of a rooster. Once at Aldo’s place, we were shown to our tent (he has five tents, two rooms, and a cottage up for grabs), a large, 3-season, 6-person tent complete with fan, battery powered lantern, and inflatable mattress with sheets and pillows. It was very clean, very spacious, and very comfortable. I shall never camp without an extension cord running a fan into my tent, from now on. The rustic style honeymoon showers had great hot water, and the toilet (picture a fancy outhouse with flush toilet) was great. Since his establishment was still pretty new, the wood still smelled like wood, giving it a cabin feel. 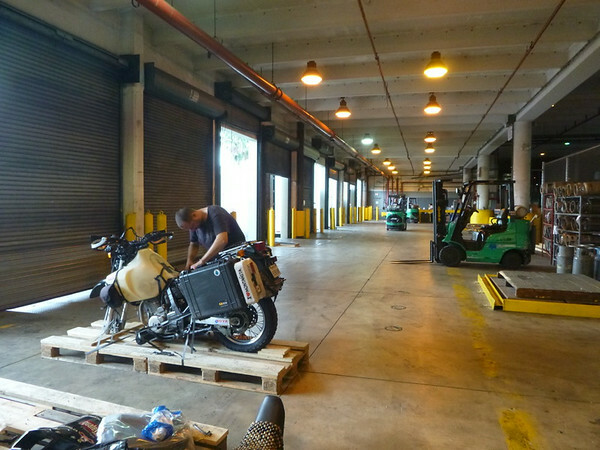 We arrived at the Aerolineas Argentina’s cargo handling facility with air waybills in hand and waited to pick up our bikes only to find out that there was a hold on them, put in place by customs. A visit to the customs office revealed that there was missing paperwork referring to clearance from the EPA stating that the bikes conformed to USA emissions standards. Even though Adam told the supervisor that the very same bikes were sold in the USA, we had to provide them with proof that they conformed to EPA standards before the hold could be removed. Apparently this paperwork was supposed to have been done on the sending end of the shipment. They sent us back to the airline office so that they could help us complete this simple task. Back at the cargo handling office, nobody had ever seen this paperwork before and directed us upstairs to the airline office. They had also never seen this paperwork before and we all headed back downstairs to the handling office where it was decided that we needed a broker to help us fill out the paperwork in order to release the bikes into our custody. The airline agent (Ray) made a few phone calls and eventually gave us a drive over to the brokerage office that they normally use – Alpha Brokers. The agents at Alpha had also never seen this paperwork and had never dealt with a case like this before but were up to the challenge and willing to give it a go. After much debate using unknown terms to us, we were sent with Sergio (the owner’s son, and employee) back to the customs office to try to reason with them. They discussed bringing the bikes in on a “T.I.B.” but apparently the T.I.B. could not be cancelled at the Canadian border and the brokerage agency would be stuck with double the duty on the cost of the bikes – which didn’t really make much sense to me since the bikes were purchased in Canada and didn’t really have any duty to pay. It also made me rethink the temporary import processes in place throughout Latin America and I have to say that the USA had over-complicated the whole thing. Yes, filling our manual paperwork can be a pain, but at the end of the process, I was given a piece of paper that allowed temporary import for a few months and sent on my way. It all seemed so very simple as I was standing in the customs office for the second time that day. There was also confusion on some of the custom agents’ behalves when they seemed surprised that our vehicles had not obtained temporary import status when we crossed into the USA from Canada in October of 2013. Obviously someone who had never left their own country by vehicle, otherwise he would have known that this is not standard procedure and that nobody would drive across the border if that was the case – no Buffalo shoppers, no snow-birds – Canadians just wouldn’t come. Anyway, we were sent away, back to the brokerage office to fill our the paperwork that allowed temporary import of a Canadian vehicle, a process that was supposed to take about an hour, according to the customs supervisor. This, however, was not the case, and after a phone call to the EPA we found out that the approval would take 10 days to obtain. Going in another direction, the EPA agent suggested that we import the bikes as being a Canadian equivalent vehicle to a USA mode (which would have been the obvious choice had the customs officer not already checked off the box he ‘believed’ to be correct – basically an all out exception based on temporary import). According to the EPA paperwork all we needed to do that was get a letter from a Suzuki manufacturer confirming that the same model was also sold in the USA (which differed from Customs original statement). Suzuki (USA) was not helpful, however the Canadian branch of Suzuki was absolutely willing to send a letter, by paper to our home address in Beaverton, Ontario which would take no less than several business days (it was a Friday). Back to the drawing board. 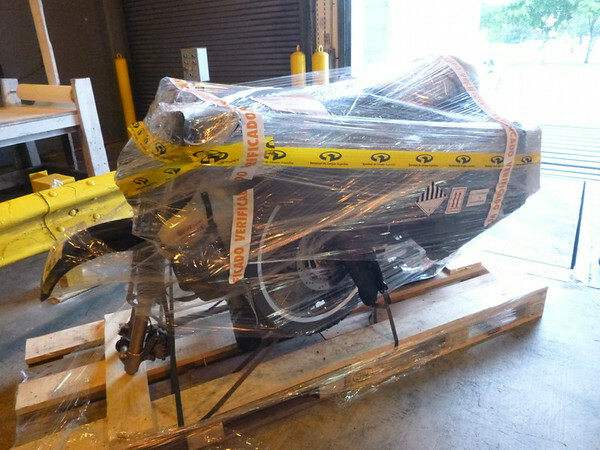 Although it was clearly marked on the EPA paperwork, we decided to print out a few screen captures from the USA Suzuki website showing the DR650 as being an available model in the USA, and take those back to customs with all of our paperwork. This time they accepted this as proof, although I am still not sure how it was so much different than Adam telling them this fact the first time we were there, and nothing that a smart phone or internet connection could have done. The hold was removed and the bikes were released. Sergio then drove us back to the cargo handling office, and after cutting us two company cheques in the amount of $50 each for the ‘terminal fee’, we presented the waybills, signed more paperwork and were allowed access to the bikes. It was 3 p.m. 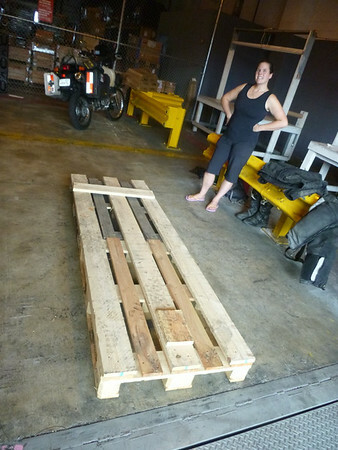 The bikes were delivered to us one-by-one so that we could assemble them. The only real minor issue was that half of the tools that we needed to put the bikes back together were stored on my bike. So we had to make do with what we had, tightening loose bolts only after my bike was delivered to us. It didn’t take too long to reassemble the bikes after unwrapping them from their freshness seal. We reconnected the batteries, put the mirrors and headlight cowls back on, put the front wheel back on, and put some air in the tires just before our Stop-And-Go air compressor died – actually, it did not really finished the job but provided us with a minimal amount. After making friends with the cargo guys, we wheeled the bikes outside, put a little gas in the tanks, suited up, and headed off to the nearest gas station. We are happy to report that there was no damage sustained to the bikes or our gear during the flight. 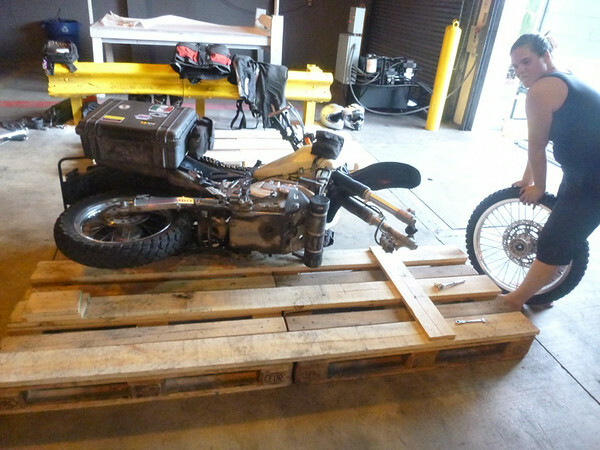 And finally our DR650s are released to us after the our customs broker repeatedly butted heads with the rhinoceroses at US Customs who would not let them into the country due to EPA violations. After repeated trips to the Customs office, head rhinoceros finally accepted that the “Canadian version” of the DR650 was no more of a threat to the clean of of the USA than the “US version”. One of the agents on a bigger power trip had the audacity to accuse of us “not properly importing” the motorcycles into the USA in the first place when we were in transit to Mexico. Remember this cross-border Canadian shoppers: you need to fill out the proper EPA paperwork before you drive your Mazda down to Buffalo! Or what you are doing is out of line! One down, one to go. Yes, Crocs and flip flops are acceptable on our side of the big yellow line (we assume). We have both been a little screwed up by the time change. From Buenos Aires to Panama City we came through a time change two hours ahead, then from Panama to Miami we went back one hour. Plus it is also summer here in Miami versus winter in the south, so it doesn’t get dark in Miami until 9 p.m. whereas it was dark in Buenos Aires at 5 p.m. We go to bed late-ish and are up early with the sun. It will take a bit of time to adjust, but we will get there. As a result of extended daylight hours, dinners have been somewhat non-existent – pizza at 11pm; cheese and crackers at 10pm – it’s somewhat all over the board. Funnily enough, “beer o’clock” seems to come at the same time every day. 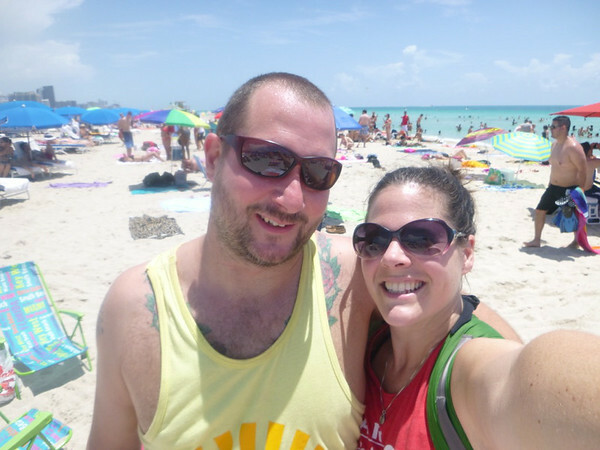 Our third day, and incidentally July 4th (Independence day in the US), in Miami brought a spontaneous trip to the famous South Beach. I had been there once before, many years ago, but didn’t swim. This trip was a beat-the-heat trip and swimming was definitely on the menu. Unfortunately I also had scheduled a Skype call back to Toronto with an art therapy group that I will be volunteering with in August for early afternoon. I was assured that wifi was prevalent and readily available on South Beach and that I would have no problems dialing in. 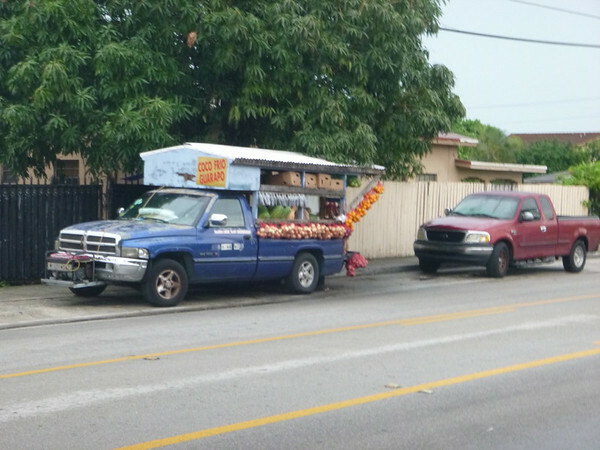 So we packed up our bags and headed out in Aldo’s truck towards the Metrorail, and Miami’s extensive transit system. We were soon to find out that while tracks and transit routes were prevalent, the actual vehicles to take you places were not so prevalent and the system was also operating on a Sunday schedule. Hialeah has a very “Latin” feel to it. Typical fruit truck. Note that lack of mangos in the tree above. It took over two and half hours, but we eventually reached the beach. It looked pretty much as I had remembered it, only with the addition of World Cup flags, which was nice since I had been experiencing World Cup withdrawal since leaving Buenos Aires. And I’m not even a big soccer fan. Beautiful, barely dressed people were everywhere, wandering around just to be seen. People dined at sidewalk cafes, bars, and restaurants with giant fishbowl drinks. The beach was crowded but it wasn’t difficult to find a spot to park our towels. The ocean was turquoise, clear, and very warm, like a bathtub (certainly warmer than the jacuzzi at Oberland Hotel in La Paz, Bolivia), and it was nice to be back in the salt water. WIFI was available just about everywhere although the challenge became finding a place quiet enough to make a call. Unfortunately, when I dialed in to the meeting from Pinkberry’s (a frozen yogurt cafe), who assured us that their WIFI was “so good” that it was “available way up the street”. I was unable to make a clear call and repeated attempts lead to the same result even though a number of Skype test calls were clear. Eventually we moved locations to the Starbuck’s down the street without any improvement. We went back to the beach for another swim, and a bit more time in the sun, before packing up and going to find food. Aldo took us to La Sanwicherie where we ordered expensive sandwiches, but they were pretty tasty and very fresh. I ordered the French Riviera salad (I hadn’t had a salad in ages!) with bread on the side and was not disappointed. I have missed vegetables so very much!! Transit on the way back was even more horrendous than the way to the beach and Adam and I ended up skipping the fireworks in the park in favour of returning back to Sun Tan Villa for a shower and some beers while we watched fireworks from the roof of Aldo’s house. It was our own little subdued 4th of July celebration, but one that was made even better by other people letting off their own fireworks to augment the large display happening further away. Our third day brought much rain to Miami and tons of thunder and lightening to go with it. Everyone staying with Aldo went their separate ways to various malls across the city. Adam and I hit the thrift stores for some new clothes, and a nearby auto store to pick up some supplies for bike maintenance the next day (our bikes were due for an oil change, a chain cleaning, and Adam’s bike needed some investigative work done on his carburetor and valves). Then it was time to say goodbye to Aldo and head out of Miami. After spending a bit more time there, it was quite a pretty city with lots to see. Although most places were accessible by transit, don’t let that fool you – you won’t be getting there any time soon. As were we nearing the last kilometers of road on the mainland, forked lightening started to increase and it was imminent that we were going to get wet by the day’s storm. I suggested that we pull over so that I could put my rain cover on my tank bag and while we were in the Shell station parking lot, the skies opened up and heavy rain started to flood the streets. We pulled underneath the covered area to wait it out. After roughly 15 minutes we were back out and on our way. As we headed south the temperature started to increase, and the colours of the houses started to grow more pastel. The more tropical the location, the more pastel your house needs to be. 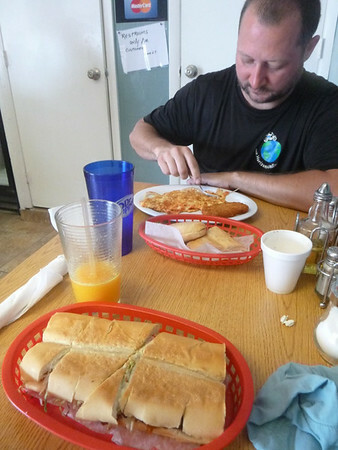 We stopped for a bite of food at a Cuban cafe serving sandwiches then continued our way over bridges spanning the Atlantic Ocean over the Gulf of Mexico. 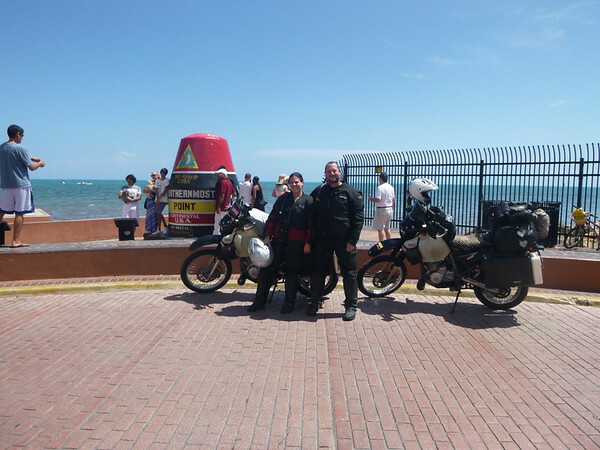 Upon reaching Key West, we headed straight to the Southernmost point marker to have our photos taken with the bikes at this monumental marker, before heading back to Boyd’s Campground on neighbouring Stock Island. Camping at Boyds on Stock Island. To add insult to injury, being the Monday night after the July 4th weekend, they soaked as for additional money for the privilege. 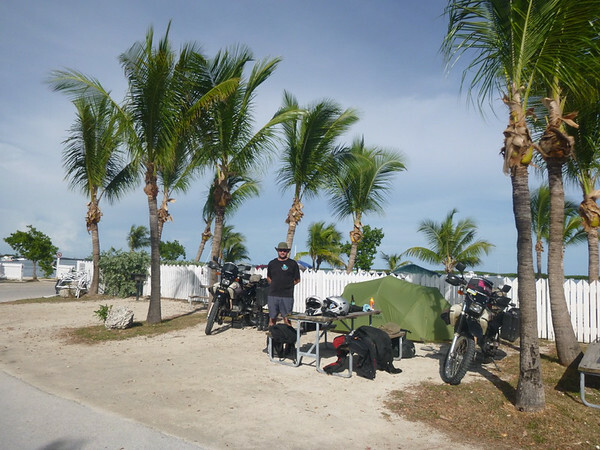 The surroundings are nice, but it was SOOO hot at the dead of a breezeless night we might have even considered a dorm at Key West hostal we found out about later. My parents had stayed here a few years back and had good things to say about it. 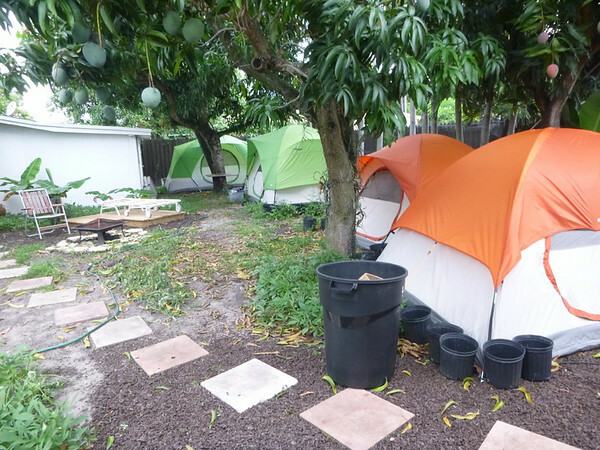 It also happened to be one of the only camping options on or near Key West, and one of the cheapest options for accommodations in the area. Having arrived on the Monday following a long weekend, holiday pricing was still in effect and we were gouged an unbelievable $67 for a campsite without hookup. We did not opt for a waterfront site, as it was $15 more (plus taxes), but our inland site was actually only about 30 feet away from the water, and with no one in the sites directly across from us, it was almost like having a waterfront site anyway. This, by the way, if memory serves correctly, was the second most expensive accommodations we have paid during our entire trip – and we provided the accommodations (our tent). And we bull our way into the famous Key West “southern most” shot with a 10 minute line-up of tourists outside of the frame. Only 90 miles to La Habana, Cuba. As Canadians this isn’t such a big deal to us, Adam having been to Havana on a day trip, and Cuba many times for dive vacations including once with Jenn. With the swimming pool calling our names, we set up our tent and headed off to the pool to cool off. The heated pool wasn’t incredibly refreshing but tropical tunes were broadcasting over the speakers, and the palm trees surrounding the pool area really set the scene for a bit of a tropical min-break. After a quick dip it was time for some food. 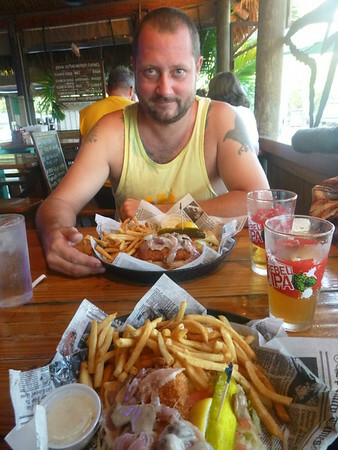 It was suggested that we go to Hogfish Bar & Grill for the “best fish sandwich in the Keys”. Although it was a bit pricier (most expensive meal to date) than what we normally go for (albeit that most places outside of Latin America would be more expensive), we both ordered the hogfish sandwich and two domestic beers. The sandwich arrived smothered in Swiss cheese, onions, and mushrooms on Cuban bread accompanied by crispy french fries. It did not disappoint. Never having tasted hogfish before, it was light and flaky and a little sweet and another very tasty morsel from the sea. Very tasty but pricey for a sandwich. We even asked the waitress whether this would have fed one or two, and were told that “we better get two”. Note to selves: back in the land where the term “sated” means to be fully “stuffed”. Advice to our non-North American friends: one meal often feeds two, and you can always order something else of you are still hungry. Contrary to the suggestions of the waitress, one sandwich and fries would probably have been just enough for two. Our first night was the worst sleep of the entire trip, hands down. Contrary to many reports from people who have stayed at Boyd’s, the night was not windy, but rather very still and very hot. In an effort to generate some sort of breeze, we slept with with only the bug portion of out tent (no fly), and ended up sleeping with the mesh doors open in order to direct what slight breeze there was at our sweaty bodies. Mostly, we only achieved a mosquito feeding frenzy while tossing and turning, both stuck with sweat to our sleeping pads for most of the night. For our only full day in Key West, we spent the afternoon wandering the Duval Street and surrounding attractions, including the Key West Cemetery which is supposedly known for the funny sayings on the headstones, and for the blend of cultures and influences on burial customs. 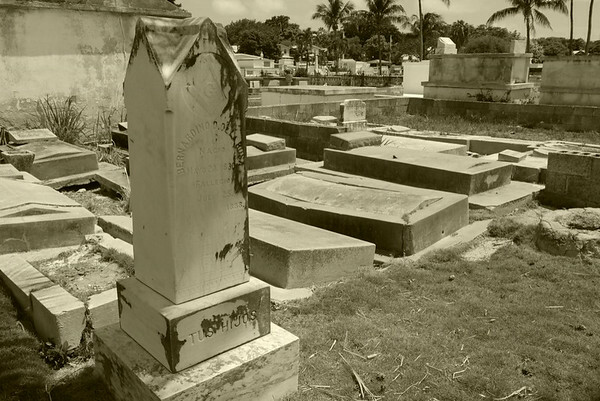 The cemetery has a pretty interesting history, having been erected after a hurricane in 1846 washed many bodies from a coastal cemetery inland. Honestly, it looked like a regular old rundown cemetery with a mixture of above ground and below ground graves. As for the funny sayings, we didn’t really see any, and left after about half an hour. After all, we did have an appointment with Happy Hour. Note to self: sometimes travel guides overstate the interest and importance of places. 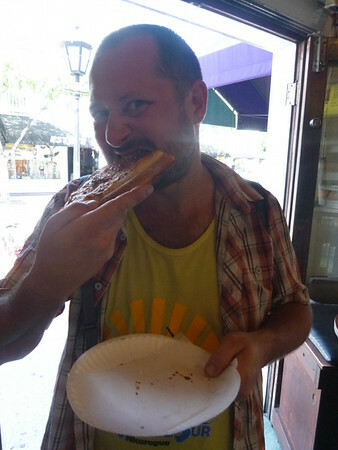 Since it wasn’t quite time for cheap drinks, we wandered down Duval in search of food (which we found in pizza – about the only ‘cheap’ thing), then down to Mallory Square (a small market, and home to the Shipwreck Museum), and then to a couple of bars. On our way to the Green Parrot we walked past a bar and grill that also brewed their own beers, called Kelly’s. Their sign advertised that they had $2 draft on their house brews, and $3.50 margaritas. I was hooked and we went inside. It turned out to be the best of the Happy Hours that we found, and stayed for a while drinking and snacking on a sort of Cajun fusions tostada. After an hour, we left in search of other Happy Hours, stopping by Captain Tony’s (no Happy Hour specials) and The Green Parrot (only crummy domestic beer specials). Before long we were back at Kelly’s for another margarita, more beer, and some nachos. It helped that the bar was almost directly across the street from the bus stop. After some $5 souvenir shopping, and a good margarita buzz, we boarded the bus and headed back to Boyd’s. Mmmm. $10 for one small drink and two burnt pizza slices. 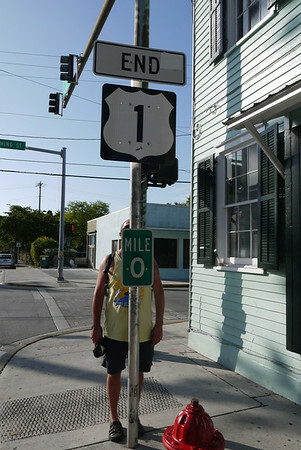 Unfortunately, after only one day, our Key West vacation was over. 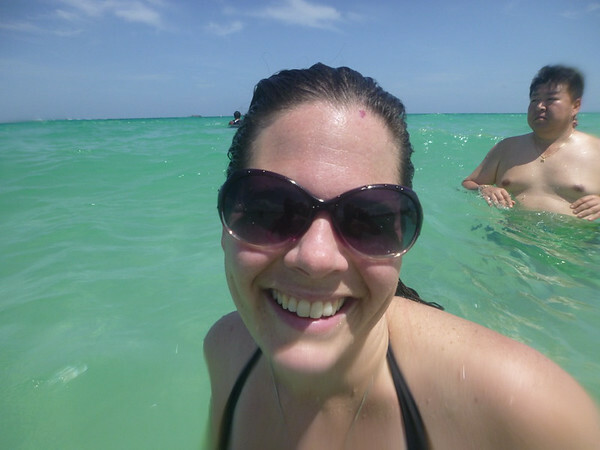 I could have stayed in Key West forever, I think. 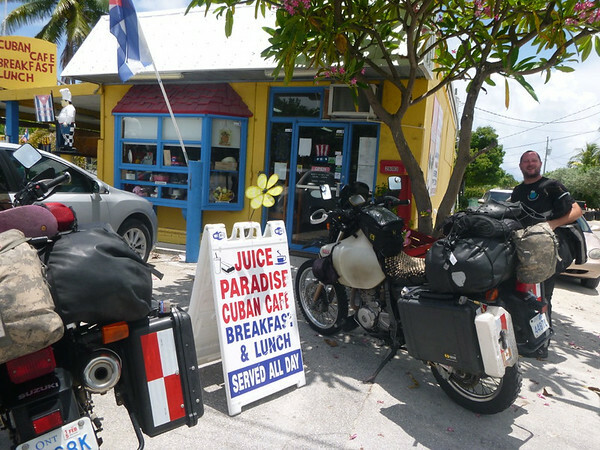 It had a great vibe – very island and laidback but not indifferent. A party zone without the juvenile irresponsibility of it all. Colourful clothing, flip flops, souvenirs, great bars, lots of food, and pastel buildings. A really great place to return to. Local restaurant. Strange mix of Cuban and American foods. “hashbrown” pucks and “processed cheese”on Cuban style omelet. 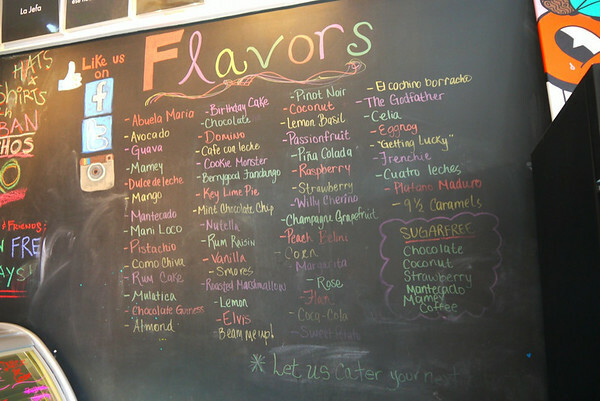 To be fair, they had a number of lunch items listed on the board which looked pretty deeply rooted in Latino culture. Note to self when traveling in USA: always ask whether “cheese” means cheese or processed cheese. After a great day with no rain, we capped it off with a nighttime swim and a couple of beers before heading off to bed. The temperature had dropped by a few degrees from the previous night and we were able to sleep with the tent doors zipped up, although it was still quite hot. The morning heat woke us up and we were off back to Miami with hot sunshine and turquoise water taking us there. When we arrived at the mainland, however, the weather was a different story. In almost the exact same spot as when we departed the mainland of Florida, we were greeted by a torrential thunderstorm with forking lightening and sheeting rain. Unlike previous rainstorms, this one was relentless and we were soaked when we arrived back at Suntan Villa. Aldo and Kira were very happy and surprised to see us back, but invited us in and told us that they had space for us to stay. Hooray! We checked in to our old tent, then waited for the rain to stop before heading to the grocery store to our regular check-out girl (who swiped her discount card for us). It was just like coming home. 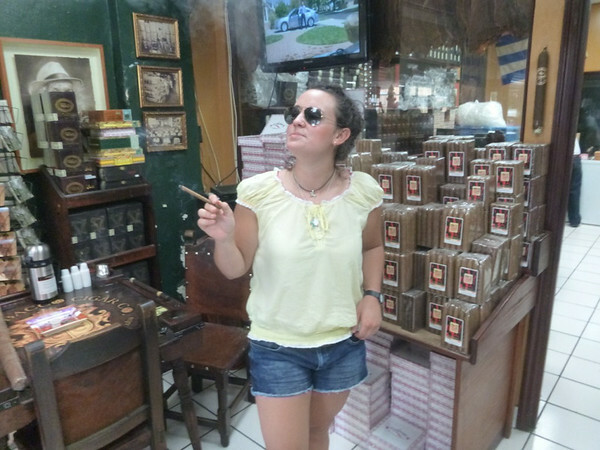 We decided to stay in Miami one more day to visit Little Havana. 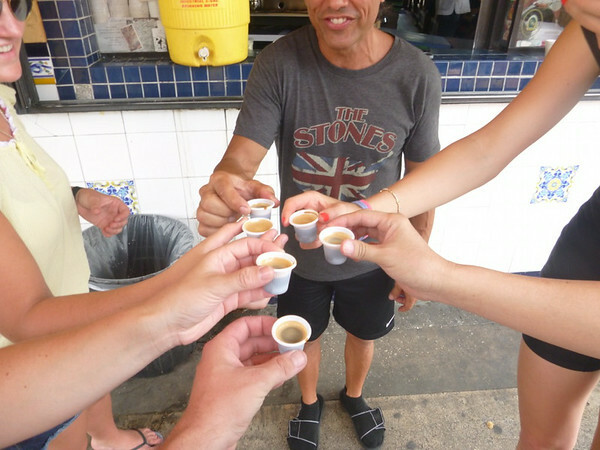 The next morning we all piled into Aldo’s truck, six of us, and headed out to Little Havana. 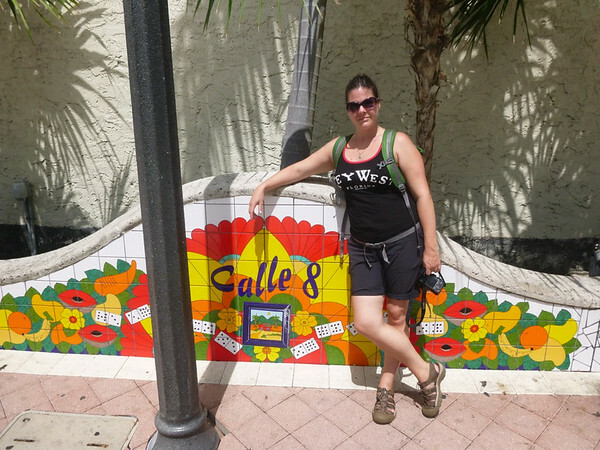 Although it wasn’t quite what I expected, it was a nice area full of flavour and some colourful things to see, including the famous six-foot tall roosters along Calle Ocho. We watched the domino players in Gomez Park, and wandered down the Cuban Memorial Boulevard where we saw the Bay of Pigs Memorial and the giant ceiba tree that is a popular spot for ritual sacrifices by people from the Afro-Cuban religion of Santeria. Its above-ground roots were littered with bones (chicken, I hope), small unknown burlap bundles, ashes, and candles. Aldo treats us to Cafe Cubano, which is apparently all it takes to maintain the use of the restaurant’s customer parking space for the next several hours. Kira, who doesn’t smoke, adopts the “go big or go home” methodology. Another one of Aldo’s guests “enjoying” a draw off of a hand rolled cigar. We will have to come again, as the flavours are in rotation. Of the uymost importance was a stop at the Azucar ice cream factory that served up artisanal flavours that were almost too good. I had the Cuban Rum Cake which was a mixture of vanilla ice cream, large chunks of rum-soaked cake, and walnuts. It was fair to say that while eating the delicious and booze-infused frozen delight I had slipped into a happy, happy place. A definite recommend, if you should find yourself in Little Havana. From Little Havana we decided to take a quick spin through an affluent area to see former home of Sylvester Stallone and Madonna’s rumoured current home. We pulled up outside of the home-thought-to-be-Madonna’s. The gate was open. Kira decided that since the gate was open that she was going to go inside. Despite a number of security cameras and a speaker box, she was able to just wander in. We all watched in awe as she waltzed up the driveway and in through the inner gate. We could see her poking around the windows and then disappeared. After a while when she didn’t return, I decided to follow her in, calling her name just in case someone confronted me about being on private property. Adam came with me, and when we found Kira she said that there didn’t seem to be anyone around. We noticed that there was an open gate leading to a next door property with a beautiful swimming pool. Kira when through first and noticed a gardener on the opposite side of the yard. She approached the gardener and asked him if Madonna lived there. The gardener then took us to the front door where the owner met us and asked us very curtly what we wanted. Like dopes, we asked him if Madonna lived there. He said no, then reminded us that we were on private property. 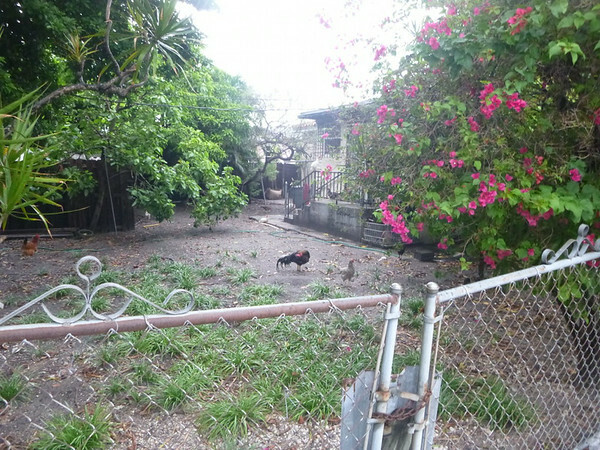 I told him that his gates were all wide open, to which he explained was for the gardener to access both his properties. I apologized for disturbing him, then noticed that he was wearing a Toronto Blue Jays golf shirt and told him that was where we were from. He didn’t really seem to care, and turned around and left his property. Although I would like to think that we had just met some Cuban business big-wig with some sort of notoriety, it seemed as though we had only succeeded in disturbing some rich annoyed big-wig, and we were lucky that he didn’t call the police. 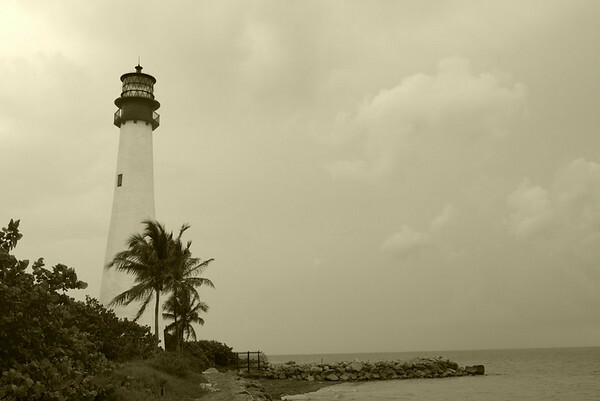 After our skirt with crime, we headed to Biscayne Bay to see the Cape Florida Light at Bill Baggs Cape State Park. The lighthouse is the oldest standing building in Miami-Dade and has an interesting history, having played a part in the Underground Railroad in Florida. It was a nice site, complete with a rebuild of the lighthouse keeper’s cottage on the aqua shores of the Atlantic. Tonight marks our last night in Miami, and it has been a treat, a very pretty city with so much to do, see, and experience. 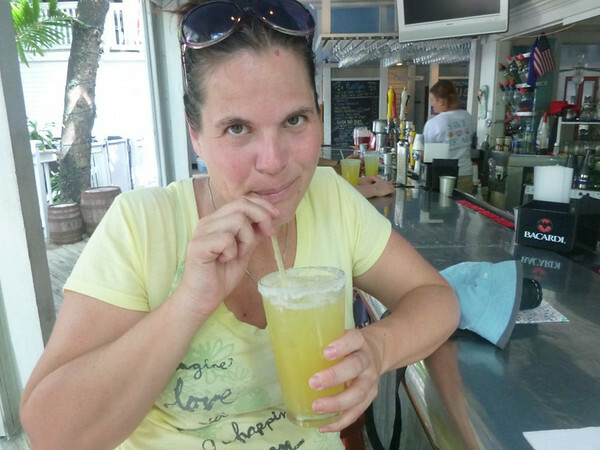 Key West has become one of my favourite travel destinations. It also signifies the beginning of our journey north to home. I am saddened to think about it being the beginning of the end of an incredible journey, but am excited to see how I will integrate the things that I have learned into life back in Ontario.